New Delhi: You may not have heard of orthopedic surgeon Gavriil Abramovich Ilizarov from Siberia, who used external devices on patients to fix infected non-unions of bones in the 1950s. But the Ilizarov technique has emerged in recent past as a preferred way among Indians to gain some extra height. Although Ilizarov surgery is an effective way globally of lengthening the bones up to four to six inches, doctors advise not to go for this extremely slow and painful procedure just for the cosmetic purpose. The two bones that are involved in the elongation purposes are the femur (thigh bone) and tibia (lower leg bone). It can take between four to six months for the process to be completed. In layman terms, the surgery involves strategically breaking the bone and then slowly separating the ends of the broken bone over a long period of time to gain extra height. This should be done under supervision of highly trained surgeons only, experts advise. “It works on the principle of distraction osteogenesis, whereby slow and controlled distraction of bone at 1 mm per day generates new bone at the lengthening site of a bone. 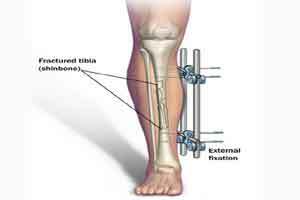 This is done using an external ring fixator or frame,” said Dr (prof) Raju Vaishya, senior joint replacement surgeon at Indraprastha Apollo Hospitals and president of the Arthritis Care Foundation. “Ilizarov surgery is a boon for patients with severe compound fractures, for lengthening of bones and for deformity correction of bones and joints,” Dr Vaishya told IANS. Dr Dhananjay Gupta, senior consultant (orthopaedics) at Fortis Flt Lt Rajan Dhall Hospital in the capital, said use of this technique for cosmetic purpose was not recommended. “As the body tries to heal the break by creating new bone, the fracture is extended yet again and the body creates even more bone in the gap during the process,” added Subhash Shalya who is associated with Delhi-based Orthopedic Surgeon Bone Joint Care Foundation of India. The fracture is extended by a tiny amount several times a day, up to a millimetre total each day, until the desired length is reached. “The trick is to do it slow enough so that new bone continues to grow, but fast enough that it does not heal entirely,” Shalya added. According to the doctors, the apparatus used today for the procedure comprises fixators, which have rings, rods and wires to gradually distract the bone parts and keep them fixed at the desired length. “The entire procedure is minimally invasive as it uses wires to fix the bones to the rings. It involves less tissue damage and ensures quick recovery. After the procedure, the Illizarov fixator is removed,” said Shalya. The procedure is followed by a lengthy rehabilitation period and extensive physiotherapy to allow the body to get accustomed to the new bone development. Like any surgical procedure, there are some issues that may crop up if utmost care is not taken post-Illizarov surgery. “Wires which are passing through soft tissue and bone may get infected and painful. Regular distraction should be done with clock-like precision as too fast or slow rate may jeopardise the outcome,” advised Dr Gupta. “Blood vessels or nerve may not stretch at the same rate and may result in loss of their function. Muscles may cause stiff joints; so this procedure must be done in the guidance of a very trained surgeon,” he said. According to Dr Sanjay Agarwala, head (orthopedics and traumatology) at Mumbai-based P.D. Hinduja National Hospital & Medical Research Centre, as in any operation, there are concurrent risks which are manageable. “As it is a slow process, it needs perseverance and persistence both on the patient and doctors’ part. The procedure has been in place for 30 years and fills a required niche in orthopedics,” Dr Agarwala told.